The A4910 - Lubri is designate for lubrication replenishment process. During this process the instrument measures the actual lubrication of a bearing and tells the operator when the amount of lubricant is ideal. So it is ensured that we do not under or over lubricate. The instrument enables you to make the whole lubricating process simpler, and decrease lubricant costs and machine maintenance costs. shorten recommended lubrication intervals, since the instrument exactly determines the ideal amount of lubricant needed. Adash has collected a large amount of knowledge by researching machine long-term operation and lubrication; and has applied it in developing the instrument A4910 - Lubri. It is simple to operate, and user’s training takes less than one hour. 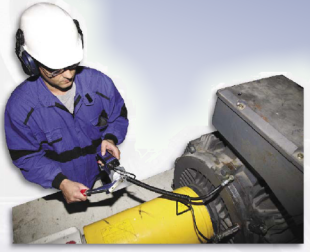 The main use of this instrument is in the lubrication replenishment process. During this process the instrument measures the actual lubrication condition of a bearing and tells the operator when the amount of lubricant is ideal. This way it is ensured that we do not under or over lubricate. When we use this instrument we can shorten recommended lubrication intervals, since the instrument always exactly determines the ideal amount of lubricant needed.